Spring and St. Patrick's Day are right around the corner and I cannot get rainbows out of my head! We started with a rainbow sorting tub and What Makes a Rainbow and we've continued on with other rainbow books, crafts, and snacks that I can't wait to share with you this week. One sweet rainbow book for preschoolers is A Rainbow of My Own by Don Freeman (author of the Courdory books). In this story, a boy observes a rainbow after a storm and goes out to play with it. While he can't actually find a rainbow, he imagines a rainbow and has lots of fun playing with his imaginary rainbow. The boy comes home and uses a prism and his goldfish bowl to create a rainbow of his very own in his room. After reading the book, we made our own rainbow-- though not with a prism as they do in the book. We'll leave that science experiment for Grandpa's house. (My dad is a retired science teacher turned most amazing Grandpa in the world). I decided a fun way to make our own rainbow was to use a part of our bodies and create handprint rainbows. I found this idea over at Mama Mia's Heart 2 Heart. 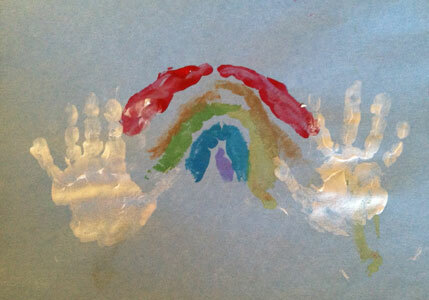 For these rainbow, use the pinky and the side of your child's hand to create a rainbow arc. As the arcs get smaller, use one hand instead of two. For the violet arc, we just used a thumbprint. After we painted our rainbow, we used our handprints in white paint to make clouds. You can also use your fists for the clouds. I love doing rainbow themes wit kids! They are so much fun! You can visit me at Creative and Curious Kids! I love the use of wee fingers! Any excuse to paint body parts sounds great to me! Oh my HOW adorable?? Love that the palm is the clouds.. what a cute way to make a rainbow! Also would make a great gift for Grandma! Lovely idea! we will be trying this out soon :) Thanks for sharing!